For student athletes at Auburn University, entering practice facilities and locker rooms is as easy as a glance at the smartphone-sized iris scanner next to the door — no key or ID card necessary — and officials say that it’s the most secure and convenient solution they’ve used. The iris reading technology, provided by Princeton Identity — a small spinoff of California-base research giant SRI International — is the Alabama school’s most recent attempt at securing the entrances to athletic facilities across its campus. While biometric security isn’t new for the 30,000-student school known for its football and basketball prowess — the iris scanners were installed in 2013 — Auburn information technology specialist Rob Stanford said his team is planning to continue supporting and upgrading the technology, which has rarely been used on college campuses in the past. The iris data is handled entirely by Auburn’s IT staff, said Jeff Kohler, a product development director at Princeton Identity. The data isn’t stored on the readers, but rather it’s encrypted and then stored on Auburn’s network “with all of the Auburn security aspects,” Kohler said. Biometric data is considered secure in that everybody has different fingerprints and eyes, but if it’s compromised, it can’t be easily changed like a password. To protect the student eye scan, “templates” used to validate entry, the school does not store them on the scanners themselves, but on a remote secure server and treated the same as other personally identifying information, like Social Security numbers. Biometric technology deployments frequently raise security concerns from the public and civil rights groups. Some schools have installed facial recognition gear in dormitories, but Stanford said that athletes and coaches have grown accustomed to the technology. Princeton Identity says it’s in talks with a handful of other universities interested in its iris scanning technology, but Auburn is the only school to put it into practice so far. 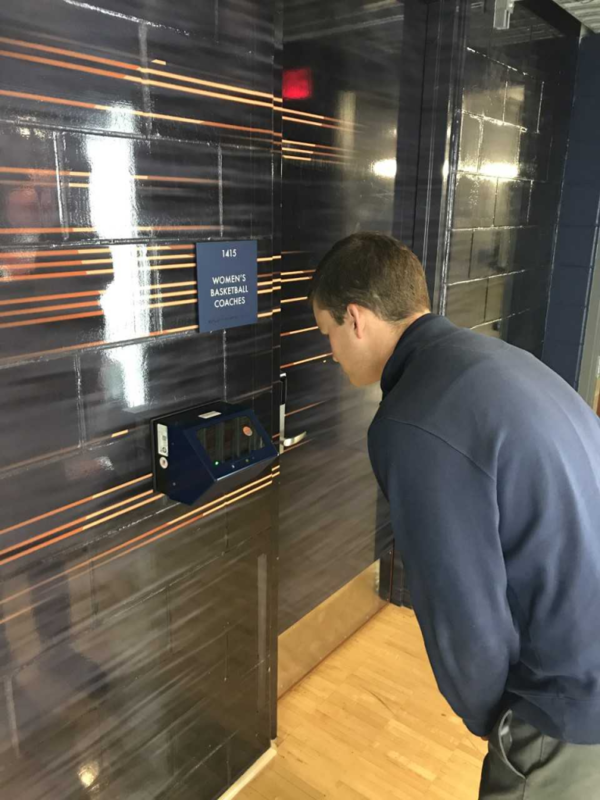 Auburn has used biometric security measures to protect its athletic facilities and locker rooms since 2010. The university initially moved from a common card reader to a biometric palm reader for convenience as student athletes don’t often carry ID when they’re in uniform. The palm-scanning devices placed at each entrance to the facilities, however, presented their own unique challenges, Stanford said. The university also struggled to deal with the challenge of the sheer size of some athlete’s hands — a custom reader had to be installed in the basketball arena, but when student-athletes and coaches grew frustrated with the devices, they arrived at an alternative solution that was eventually deemed untenable: simply propping the doors open. The school made the switch to iris readers in 2013. The university has iris scanners adjacent to card readers at many of its athletic facilities now, including the facilities for basketball, soccer, track, baseball and volleyball. The largest problem now, Stanford said, is getting the athletes to wait long enough for their iris’ to be scanned. It takes less than a second, typically, but he said many students don’t look straight at the scanner or begin walking away before the scan has been completed. Last summer, the university underwent a major upgrade — from the legacy software installed originally to Princeton Identity’s newest software, which enables athletes and coaches to enroll in the security system from a browser on any network-connected device. Coming soon, Stanford said, are new readers, which scan faster and from a farther distance than the current access points.